Maple syrup is a delicious syrup that is popular not only as a pancake and waffle topping, but as an ingredient in all kinds of recipes. Maple syrup is only made during a small window each year in a fairly labor-intensive process, so it tends to be fairly expensive and that means that many people don’t keep it on hand all the time and that Â bakers faced with a recipe calling for large quantities might be reluctant to use up half a bottle, even though maple syrup delivers a flavor that you can’t quite match with any other ingredient. So I often get asked if it possible to substitute for maple syrup in recipes? The answer is yes, it is possible toÂ substitute other ingredients for maple syrup in recipes. It is also possible to substitute maple syrup for other sweeteners. Honey can be directly substituted for maple syrup in terms of sweetness and consistency, although honey can also be a fairly expensive ingredient to work with. Â Sugar and brown sugar can be substituted for maple syrup, but because maple syrup is much sweeter than sugar and you will need about 1/3 more sugar (1 1/3 cups sugar for 1 cup maple syrup) to equal the sweetness of maple syrup in a recipe. Since maple syrup is a liquid, if you areÂ substitutingÂ sugar you will need to increase the wet ingredients by about 3 tbsp for every cup of sugar. 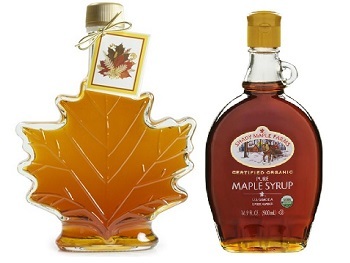 To substitute maple syrup for sugar, you should use 1/3 less maple syrup than the amount of sugar called for (for instance, use 2/3 cup maple syrup for 1 cup sugar) and decrease the wet ingredients by approximately 2 tbsp for every half cup of maple syrup added. 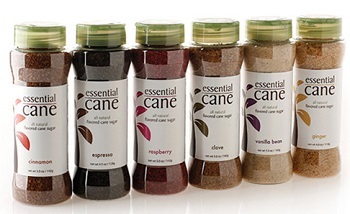 When substituting ingredients, you may find that you need to be flexible on the exact amount of dry or liquid ingredients added to ensure that the consistency turns out right. To choose a good substitute, it is also important to know how much syrup your recipe calls for and what the result will be. For instance, in a recipe that calls for maple syrup as its main flavoring agent, you might want to substitute only a portion of the maple syrup for sugar. If a recipe only calls for a small amount of maple syrup, you might want to choose to use brown sugar or honey and replace all of the maple syrup. You should not reach for “pancake syrup” – anÂ artificiallyÂ flavored corn syrup product – because you probably will be disappointed with the results if you do. And if you find you are out of maple syrup and only need to finish off your homemade waffles or pancakes, try making a Quick Berry Syrup, a homemade caramel sauce or just heating up some jam and drizzling it on before serving instead of running out to the store. These are great swapping tips! Thanks! I live in Quebec, the world’s #1 producer of maple syrup. Therefore, I’m lucky to have maple syrup as a staple of my pantry. Thanks for this article. I have a granola recipe that calls for apple juice concentrate, but would like to use pure maple syrup instead. Is there a ratio I should follow? Bill – There is no ratio for that kind of substitution, since apple juice concentrates are much less sweet than maple syrup and will also vary in their sugar content from brand to brand. You may just have to experiment a bit to ensure you get the sweetness and texture that you’re looking for. I am making a recipe that requires maple syrup and I don’t have the proper amount, so this is good to know, we live a short distance from where maple syrup is gotten from, it’s plentiful here but there are no stores I can get to to buy it at the moment. Thanks for this tip. I am on a low sugar diet. The only sugar I care to consume are the natural sugars found in almost every fruit. What are your thoughts on replacing maple syrup with bananas? I am not concerned with the sweetness level as much as I am with the consistency and texture of my baked goods. Kim – You will definitely not get the same texture if you substitute bananas into a recipe that calls for maple syrup. Bananas have so much substance to them that your batter will be much thicker and your finished result will likely be much tougher. I would experiment with reducing the maple syrup in a recipe, rather than replacing it with something like a banana. I was looking for a way to substitute maple syrup, because I live in Italy and here it’s extremely expensive (it has to be imported from abroad) and hard to find. Honey here is way cheaper, but not everyone in my household likes it. Not everyone finds male syrup appealing. To me it’s nauseatingly sweet. I guess I’ll try a 3/4 measure of honey and make the balance up with water. So is flavour the only reason you wouldn’t suggest using “table syrup” over maple syrup or would it affect the final product more seriously? Hi Teresa, The flavor could have a huge impact on the final product, as artificial maple flavors could bake off (leading to a bland product) or intensify when they are heated. In general it depends on the recipe because maple syrup has different properties than corn syrup does. For instance, it crystallizes when heated, which corn syrup does not. 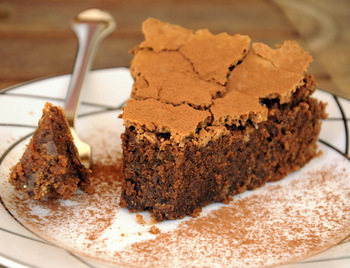 A few tablespoons in a cake batter may not make a huge difference, but in a recipe where maple syrup is a primary ingredient, it will definitely have an impact on both the flavor and the texture of the finished product. I’ll also note that some table syrups contain thickeners/emusifiers, which could have an impact that final product in any given recipe, as well. Honey (real pure honey) tastes way better on pancakes and waffles than maple syrup. In the U.S. many people buy “pancake syrup” like Mrs.Butterworth which is made out of chemicals and corn syrup, I used to only have that on my pancakes and so I wanted to switch to a healthier alternative and so I tried real maple syrup for the first time and didn’t like it, it was more watery in texture than the Mrs.Butterworth pancake syrup, and tasted just like just water with a bunch of sugar dumped in it, I could not taste anything else, so then I tried real honey instead and it was much closer to the texture of that chemical ridden Mrs.Butterworth which is thick and sticky except honey is healthy but tasted closer to “pancake syrup”, and had hints of other flavors rather than just sugar water that maple syrup tastes like to me. I wonder if I am the only one who finds that maple syrup just tastes like sugared water and has a thinner consistency but that honey has more flavor and is thicker in texture?